It is of no wonder that Mark Twain once said “Mauritius was made first, and then heaven, and heaven was copied after Mauritius”. 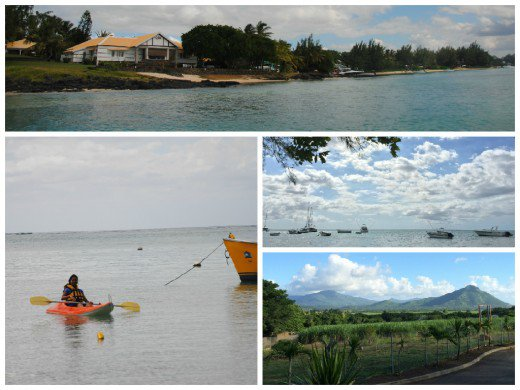 Having heard a lot about the beauty of Mauritius, we decided to visit this island and booked a seven day package. 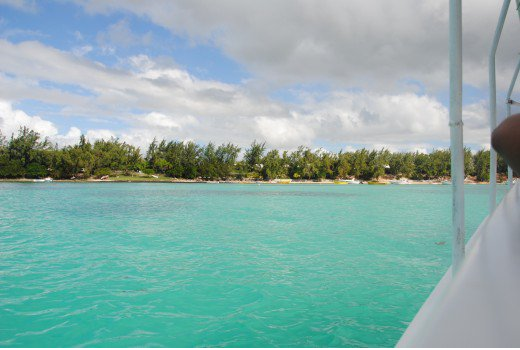 An island located in the Indian ocean, the beauty of Mauritius was truly beyond our anticipations. I am glad to recall our days at Mauritius for the readers out here. We boarded Air Mauritius from Bangalore and landed at the Sir Seewosagur Ramgoolam Airport, Mauritius by afternoon. It was the soothing breeze and the serene nature that welcomed us, rather than the welcome placards. We got into the coach arranged by our travel agents, and we were dropped to Hotel Coin De Mire Attitude, where we were to spend our week. 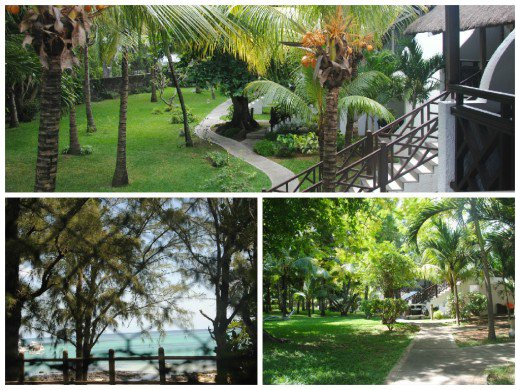 It was a beautiful hotel, facing the crystal clear sea and the rooms surrounded with an astounding natural beauty of lush greenery and coconut plantations. It was almost dusk by the time we freshened up and we headed towards the dining area for dinner. After a delicious Mediterranean buffet dinner by the pool side, we were back to our room to welcome the next day. It was a beautiful morning, and we were all excited, looking forward to the water activities we had in our plan for the day. The breakfast menu was just perfect, with a mix of pancakes, varieties of breads, eggs prepared on your choice, sausages, bacons, chocolate drinks, juices and salads. Our pick up van was waiting for us, by the time we were done with the breakfast. 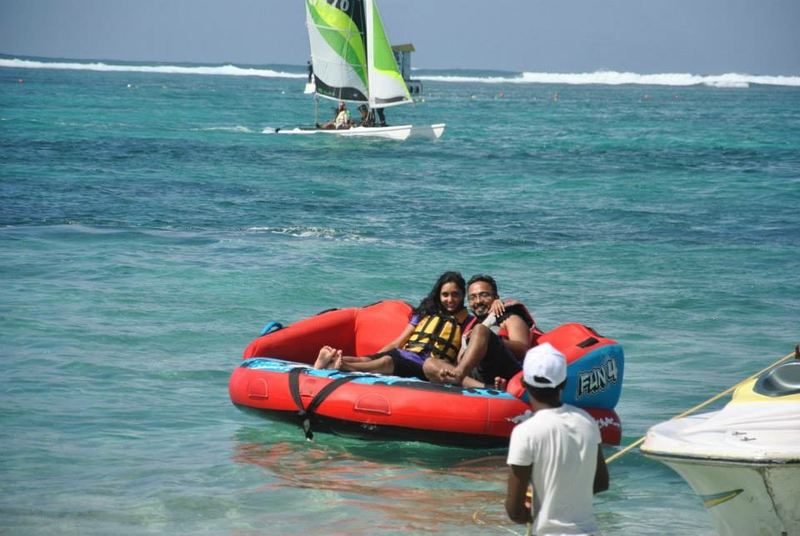 We, along with a few other couples were taken to the sea side at Grand Baie, and we were all set to plunge into the emerald waters and enjoy the water activities there. We booked a package that included the Undersea walk, Parasailing and Tube ride. 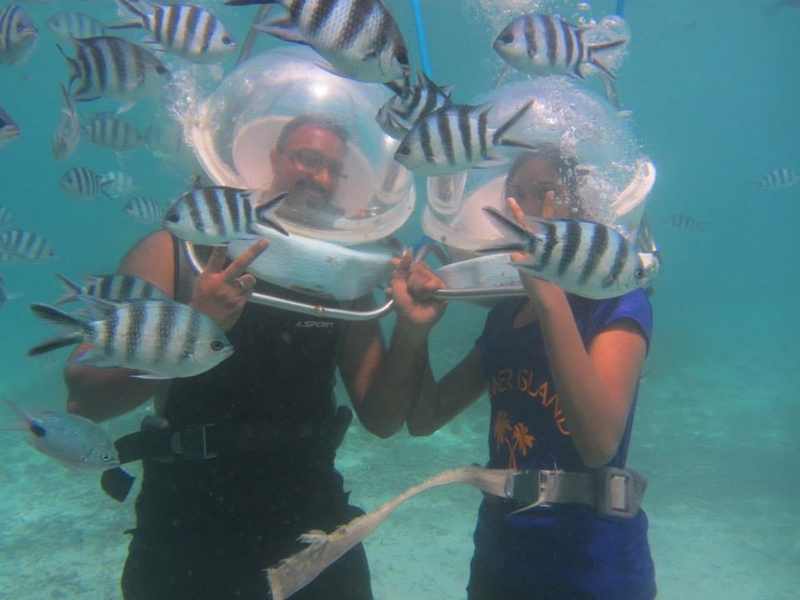 I must say, being under the sea was just an unbelievable experience that one should never miss out in life. We were taken to the diving platform in the middle of nowhere in a boat. It was a scaring yet an exciting moment for us, visualizing ourselves under the water in the moments to come. We were asked to set our footsteps down a ladder that went into the sea and giant helmets(supposed to be 42 kgs!) were fitted on to our heads. And…before I could think what it was I could see myself at the bottom of the sea surrounded by a shoal of coloured fishes! It was a moment where I couldn’t believe that I was still breathing! An instructor underneath the water accompanied us, capturing our pictures, and we had a 15 minutes walk under the sea. We had an excellent view of the beautiful corals and few other patterned fishes and even had a chance to feed the fishes. The fifteen minutes under the water passed like just fifteen seconds, until we were signaled by our instructor to move up. Back at the shores, we waited for our tube ride. We were provided with life jackets and were seated on a tube, having just a handle on both sides to hold on, and our tube was pulled by a speed boat attached to it. The strives we had as we both clung on to the handle to hold back our bodies, the screams we made out of joy, the waters splashing on our faces all made a ten minute ride through the dashing waves an indelible experience. 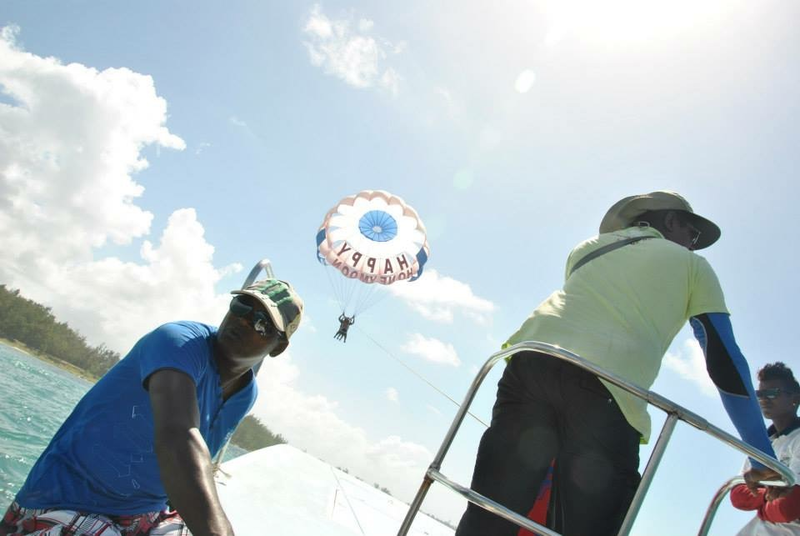 After the fun filled activities under the sea and on the sea, now it was our turn to fly over the sea when we boarded the boat for Parasailing. It was a breathtaking experience as we flew over the crystal clear waters and enjoyed the enchanting beauty of the island from a bird’s view. The flight lasted for a few minutes and like a small kid, I couldn’t express how badly I wished for a second ride on it. After a traditional Mauritian lunch, we were taken to Ile Aux Cerfs island, which is known to be a privately owned island in a speed boat, The speed boat ride to the island was just awesome and the view of the island with its swaying palm trees, clear blue waters and its white sand beaches was just as if we looked into a beautiful painting. Our next day was actually meant for the Catamaran cruise, but unfortunately due to the bad weather conditions, we had to cancel it. We were initially upset, yet with the help of our travel agents, we planned for something daring! 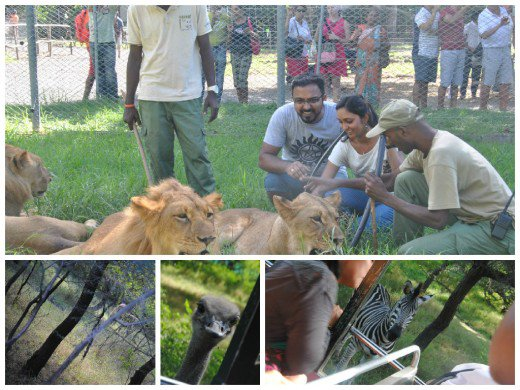 It was to a visit to the Casela, a nature park, to experience the interaction with lions. It was a long journey, more than an hour from hotel, and this was our opportunity to explore the countryside of Mauritius. We passed by vast sugarcane fields and tea estates, enjoying the beauty of the coastal plains afar, and reached our destination in the western part of Mauritius, the Casela nature park. Lot of visitors from different parts of the world were queuing to get the entry tickets.. It was a perfect spot for adventure lovers, with a lot of activities to try out. We had opted for Jungle Safari and Lion Interaction. The highlight of that day was the interaction with lions, an ever first experience in my life. We were welcomed into the lion’s encounter provided with sticks to hold with us which they considered as a safety measure! (Well, I wondered how a stick could be a safety measure against the lions!). We were in a group of four along with our instructor. 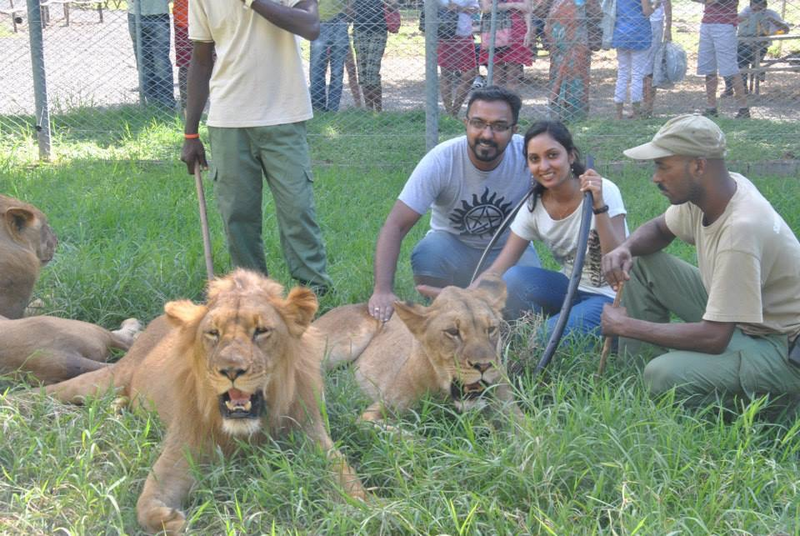 Thereafter were the awe inspiring moments as we patted the lion, sat beside it and posed for pictures along with them. The park covered such a vast area that we were almost lost on our way until we reached the starting point for Jungle Safari. It was an hour ride in their Safari bus through the Casela jungle stopping at points to watch zebras, antelopes, ostriches and giant tortoises. It was fun watching the ostriches come near to us and gazing at us through the window and at times it even tried to get on board of the bus! During our next two days, we were taken to the North and South East regions of Mauritius, stopping at various sightseeing spots. The capital of Mauritius, Port Louis being the main centre of economy remained unpolluted and the roads were clean and well maintained. 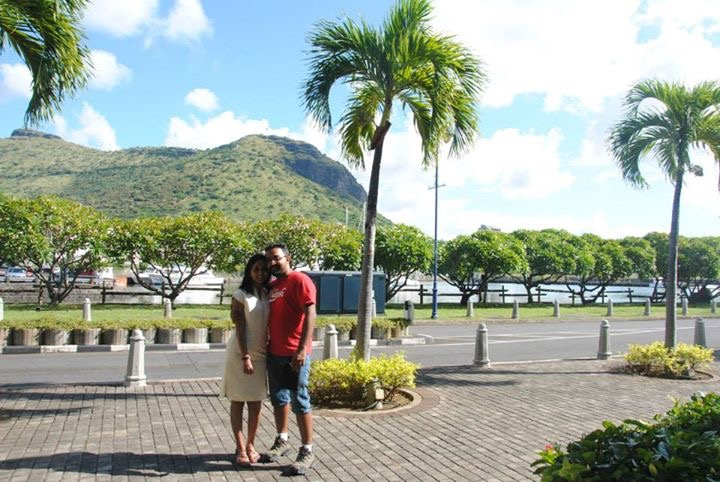 At Port Louis, we stopped at the Fort Citadel, an old fort which was built by the British around the 19th century. 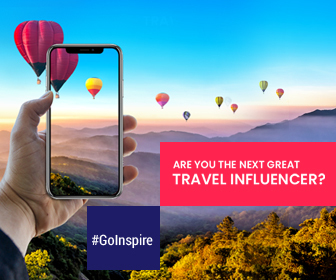 On climbing up, you get a fantastic panoramic view of the whole city with its French colonial buildings, the harbor and the faded view of distant coastal plains, making it a perfect spot for photography. We took our time to click some snaps, and then we were taken to a nearby shopping center, right besides the waterfront, the Le Caudan Waterfront shopping complex. The place seemed to be an all time hangout street with a lot of shops for jewelers, souvenirs, chocolates and handicrafts, restaurants, ice cream parlors, movie theatres and a casino too. The streets were just amazing with colorful umbrellas hanging all over, was something which I really loved there. A team of professional bicycle riders were performing a bicycle stunt show on those streets and it was a thrilling experience, to watch them play wonders with bicycle. 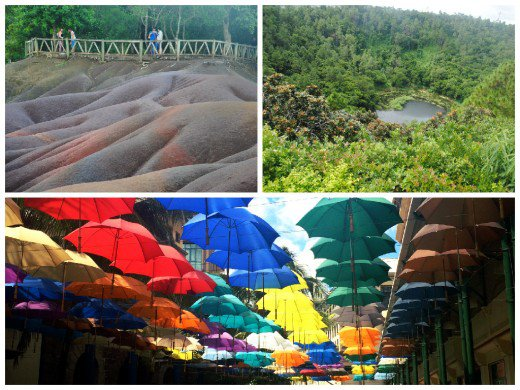 Another busy tourist spot we visited in Mauritius was the the Trou Aux cerfs, a volcanic crater situated at Curepipe. This is a cool spot in Mauritius where we found the nature at its best. It was a splendid view of the dormant volcano, surrounded by thick flora with a small lake in the middle, making it yet another perfect spot for nature lovers and photography. It was yet another feast to our eyes as we visited the Chamarel, the seven colored earth, something that was created out of natural phenomenon. The small protected area of sand dunes were clearly visible in seven distinct colours. It is said that due to tropical weather conditions, the water soluble elements have been washed out and the remains are what were visible there in different shades. We could see shades of sand in red, brown, violet, green, blue, purple and yellow colors. A rainbow on earth! Would you believe me if I say you would never find a poisonous snake in Mauritius? True! We were pretty surprised to hear from our tour guide that no snakes that are venomous do exist in Mauritius. The soil is uninhabitable to such creatures. You would even not find any poisonous insects or wild animals in those islands. Natural security means a lot in Mauritius. The island is surrounded by thick coral reefs that subside and calm down the high waves as they reach the shore. Hence they provide a natural security from seismic waves that can harm the country. The coral reefs also help in bringing down the temperature of the ocean waters, making it ideal for swimming and also provide protection from sharks or other aquatic animals. The Mauritian government plays much a better role in ensuring even more than the basic needs of a country. Free education from primary to higher secondary levels is provided to all Mauritian citizens along with free public transportation for the students. 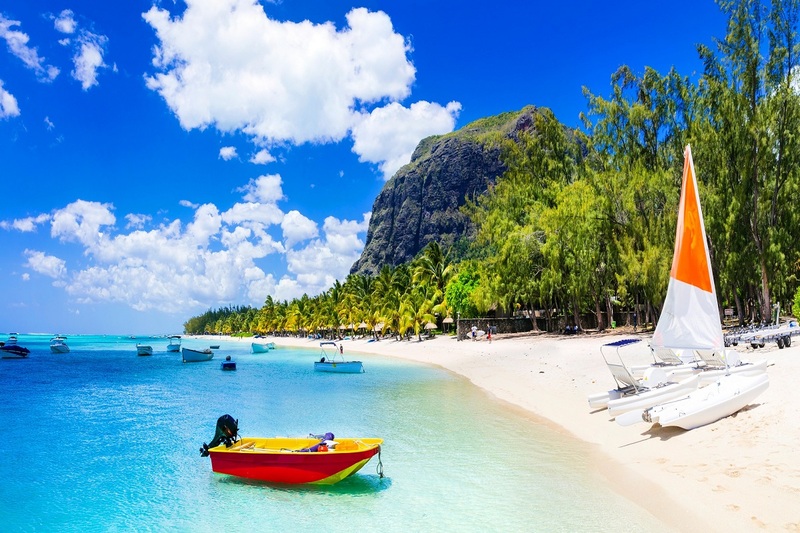 Medical services is also provided free of cost to everyone in Mauritius. What’s better! And yet another interesting fact we came to know was that Mauritius is one among a few countries that doesn’t have a standing army. Our tour guide was pleased to say that Mauritius is a peaceful country with no marks of terrorism or any kind of violence. A complete tranquility prevailed throughout the island. We were really surprised to see the Parliament of Mauritius with not much security controls, something which can never be seen in many countries. After a great fun filled week, it was time to bid farewell to Mauritius. It was our last day. After a quick pack up, we walked towards the nearby beach to spend the evening. There were a few activities provided by our hotel like the glass bottom ride, kayaks and pedal boats and it was our time to try those. We enjoyed a ride on the Glass Bottom Boat, as they took us to different areas of the sea where you could have a closer view of the beautiful corals and fishes. It was even more fun to try out the Pedal boat and Kayak, paddling ourselves over the blue crystalline waters. It is beyond my words to describe the beautiful evening we had. 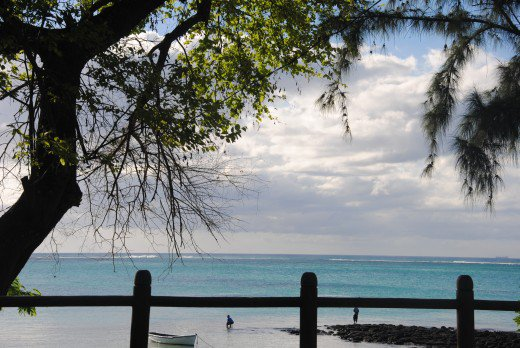 To have a long walk along the gentle blue waves touching the shore, to watch the sun disappear below the horizon, to watch the kids playing with the soft white sand, and to sit back and relax by the shades on the shore watching the scenic views of the sea and the island, was simply the best way to say adieus to Mauritius.